Have you tasted our Pumpkin Cream Cheese Filling? 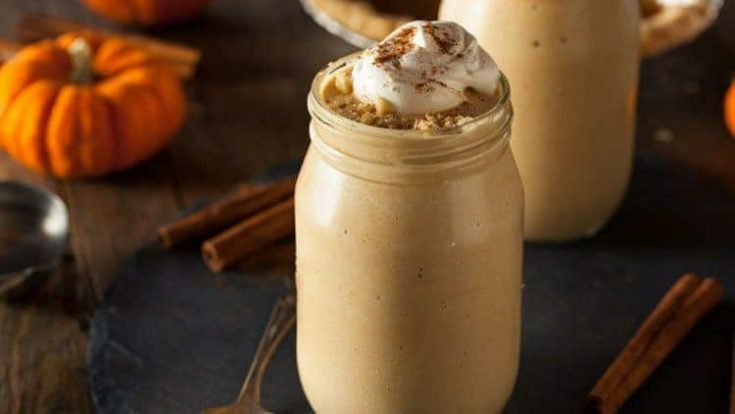 It’s great for a Pumpkin Pie Bagel and French Toast with Pumpkin Filling, and it is amazing in a Pumpkin Cream Cheese Milkshake. They got creative and decided to use a couple scoops of the Pumpkin Cream Cheese Filling in these delicious Pumpkin Pie Milkshakes. Okay, I know there is sugar in it, but it’s nice to get some extra nutrition in their snacks as well. Can’t you tell we love pumpkin? We love pumpkin all year long, but there is something about fall that makes the flavor of pumpkin even more special. It is purely amazing–pumpkin spice flavor in a cold milkshake beverage that goes down smooth and makes everyone happy. You’ll love it! Mix ingredients together in blender to taste. If you're a big pumpkin lover, add a bit more of the pumpkin cream cheese filling. We make perfect creamy milkshakes on a regular basis around here simply by adding a little milk, then a few scoops of ice cream, followed by whatever extras. This time it was the Pumpkin Cream Cheese Filling, but most of the time it is peanut butter and chocolate.